â€œEcommerce PROâ€ is a complete solution for Multi Vendor Ecommerce Business Management System. 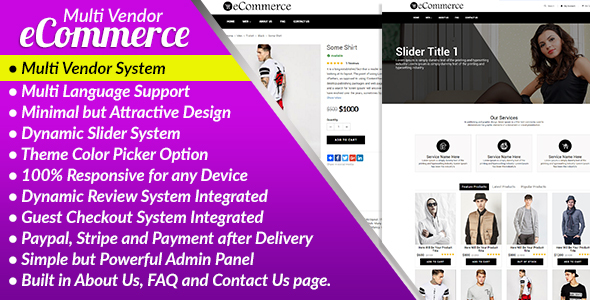 This CMS Includes almost everything you need to make a ecommerce business website. Paypal, Stripe and Payment of Delivery is integrated for easy payment transaction. There are three types of admin panel for Users, Vendors and Website admin. When user will purchase different products from different vendors then admin will get the order details as well as each vendor will get the order details of his/her products. Vendors will not see the other vendor order details.